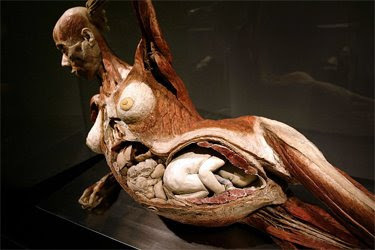 In case you are wondering, yes those are real human bodies that are plastinated (a preservation technique) and displayed to the public for both educational reasons, aesthetic reasons, and for reasons that will make us appreciate the complexity and beauty of the human body. 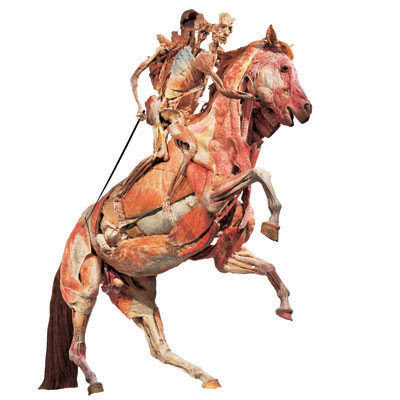 I've seen the exhibit yesterday at the Telus World of Science and I have to say that I was a bit shocked with the way the human bodies were displayed. They were made to do these positions and the positions were not the thing I was disturbed with, but the way the bodies were positioned. How would you imagine your dead body holding your own brain on your hands? It was weird and I felt like I was in a circus. 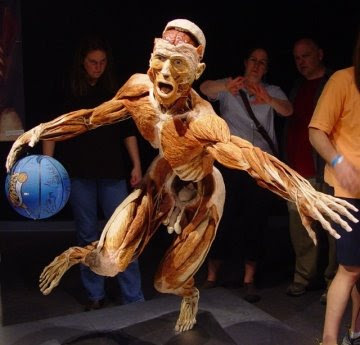 Plus I really believed that the exhibit should have only been reserved for the people in the medical field but then again that would be unfair, it's like keeping knowledge from the public. 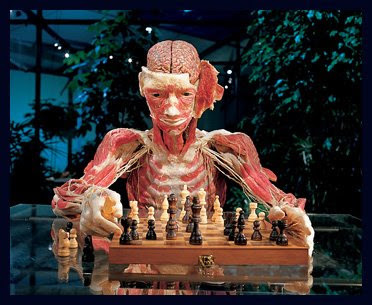 Over all I was pretty amazed with the exhibit, the bones were boring but as we were half way through the exhibit the stripped human bodies were actually interesting, although I really feel that it was wrong to see human bodies displayed in that fashion.